Folks, I have a new boyfriend. There. I said it. And we’re totally in love. We’ve DTR, yes we’re totally exclusive, and it’s kind of all I think about. I spend as much time as I can with my new lover, and my friends and family are starting to wonder if I’m co-dependent. Yes. Yes I am. But dern, skating makes me happy. Yes, skating. I yearn to lace up, don cute stockings, and skate like the dickens to make “us” work. Last night we had a date. Two actually. Followed my usual Tuesday night speed skate class (think Apollo Ohno, but on quads) with an hour of STREET SKATING, hosted by the very awesome (and informative) Dilla. What an invigorating experience that was. Fellow skater Hannthrax succinctly summed it up, “It was FUN! And a little scary. People yelled WOO! at us. Can’t wait for next week!” Today’s blog is a nod, and a legal hip-check, to my very awesome new boyfriend “Skating…” whose love I rekindled through Derby—the best sport ever and ironically one that doesn’t allow boys! Artist Matt Schwartz of SheHitPauseStudios… “This is an 11×14 Polaroid transfer of an awesome pair of classic roller skates. I was driving around with these for a while before I stopped aside a lake and hung them from a tree.” Sure hope he didn’t leave them there. These are so Xanadu, I can hardly stand it. Matt Ruby’s “Going Nowhere” sculpture combines a roller-skate and armchair (hmmm, furniture AND a skate, he’s so talking Gadora’s language). He’s “exploring themes about old and young, and how these ideas create meaning, and contrast.” Gives me pause for thought, how long will skating and I make it? Here’s hoping…. Regular readers know I like my Fo-bots…here’s one on skates. 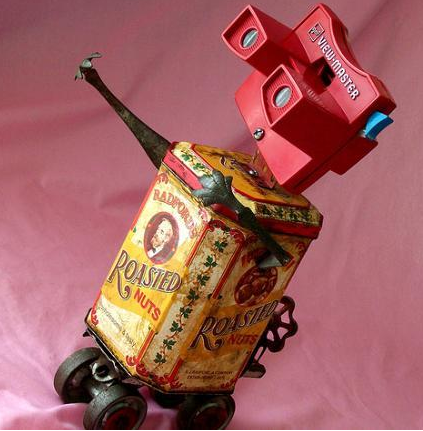 Artist Tim Hornyak created Radford ~ “With a retro View-Master head and an antique English tin (Radford’s Roasted Nuts) for a body, Radford is a juxtaposition of eras in retail manufacturing. A roller skate completes his eclectic appearance. A faucet, valve, and tongs make up the rest of this lovable piece.” Thanks Will Wagenaar for the photo. Tim Hornyak's "Radford" skate-bot rocks. While this one is not remotely close to fine-art, this IS a little something for my Sister and her very handsome Weimaraner Melvin – whose watercolor I did a year ago. Get a load of Wegman’s Weimaraner Jigsaw Puzzle. 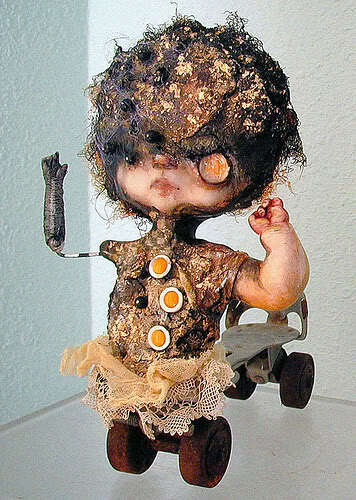 Artist Tricia Joy Anders’ art, as told by Stacy Alexander, “takes many unique twists and turns, stretching her imagination and everyone else’s, resulting in amazing (She hates that word 😉 ) art dolls, paintings and altered this or that. She can touch just about anything and turn it into art. Look what she did with this roller skate!” A few Derby girls might argue this is what a foot looks like, post years of hard work. Pshhh, MY boyfriend will be much more gentle. Right? Tricia Joy Anders skate doll. To circle back around to last night, “Naked on Roller Skates” is quite possibly the ONLY OTHER THING that could have made it any better (sadly, Me Shove You Long Time’s skates petered out on her before she could roll with us). With tagline, “An Unscrupulous Rake. An All-Wise Young Lady. An Unexpected Love Affair…” I feel fund-raiser formulating!!! Tonight, along Austin’s famed 6th Street, we rolled upon a well-heeled bride and her photographer (thankfully, not literally) who’d paused in between photos. We snickered about crashing the photo session… why wouldn’t the bride want 20+ derby girls in dark (sweaty) clothes, mouth guards, and derby gear in her photos? Perhaps just one? Never mind. We’d have a big ole’ wedding, my Lover and I. I’d have 200+ derby brides maids and maybe only two would wear white happily, but that’s why I love them. Tampa photographers: Divine Light. Love. Thank you Derby boyfriend, I see our future. And it’s a good one. DerbyGirl.com ~ This is your one-stop shop for all things derby! Derby News Network (DNN) ~ Fill yer boots with derby, too. Derby Saved My Soul ~ Marilyn Monrollher, you said it Sister. Oh, how I know your sentiment: “I LOVE IT!!! Totally 100% obsessed with it. You feel sooo…. alive.” I’m including your picture Monroller, you’re that darn precious! Texas Roller Girls ~ I heart those girls who gave me sure footing in this world. Posted on June 23, 2010 November 7, 2012 by gadorawilderPosted in MusingsTagged easy art project, Rec-n-Roller Derby, Roller Derby, Roller Girl, Roller Skates, vintage. I see the sparkle in your eyes the moment you tighten the laces on your skates and tie the knot. It’s love. I wonder how long the Weim was in skates!!! I love you Sis! Thanks for thinking of Mr. Melvin! ROLLER DERBY…..Another reason to be a fan of yours MS. Gadora WildeR! in the classic RD movie Kansas City Bomber that was filmed in PDX in 1972. Way To Go Girl! I’m totally cheating on my boyfriend with rollerderby. It’s crazy how quickly the obsession developed. Can’t wait for more street skating. Felt like a bit of a spectacle, but also that’s a part of derby, no? You made what was already a 10 for me a 15 with your enthusiasm of your new love. It was fun skatin with you again. Tuesdays are hockey nights for me, but maybe we can get an additional nite of street skating going. A-MEN woman! I raise a glass in celebration to you and your new love–may your relationship be long and fruitful. LOVE LOVE LOVE you… AND derby!